This make-ahead turkey gravy will take the stress out of managing to get your turkey dinner on the table without having to worry about making gravy as your guests arrive. The broth for this make-ahead turkey gravy can be made up to 2 days before making the final gravy, and the final gravy can be made the day before your holiday dinner and then reheated just before you serve the meal. If you want to add the pan drippings to the gravy, just strain them into a fat separator, and add the defatted juices to the gravy as you are reheating it. I have always struggled with making the gravy just before serving a holiday meal. When my favorite aunt Chris was with us, she always offered to take over making the gravy, and she would miraculously and calmly whip up a rich gravy with the pan drippings, a little flour, and some water on my (then) crappy electric stove top. Unfortunately, I did not inherit Chris' gravy making talent. Either there are not enough drippings, the gravy doesn't thicken (or thickens too much), or the gravy is pale. 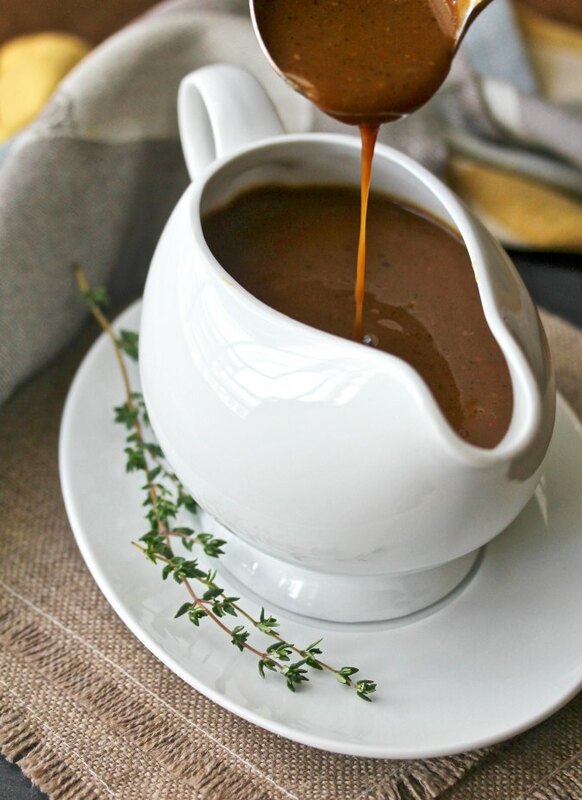 If you're like me, you need to try this make-ahead gravy. This gravy gets its deep flavor from browning and sautéing the turkey neck and gizzards (not the liver though). You can also optionally add the turkey wings to this mixture, or just the tips, especially if you'll be roasting your turkey in parts or if you do not carve your turkey at the table. Once you've browned the neck and gizzards, you deglaze the pan with broth and water and simmer the mixture for half an hour. This creates a delicious enriched broth that you will use to create the gravy. When you are ready to make the gravy, you create a roux with butter for the fat, and then add the hot broth to make the final gravy. This mixture can be made up to a day in advance. If, for some reason, your gravy is too pale, you can always add a drop or two of Gravy Master, Kitchen Bouquet, Maggi Seasoning, or my new favorite, Pearl River Bridge Dark Soy Sauce. I can't believe it's almost Thanksgiving! It sure seems like it's early this year, but at least that means that there is more time between Thanksgiving and Christmas. Along with gravy, you'll need lots of sides for your holiday dinner. I've joined up with some food blogger friends to bring you lots of recipes for holiday side dishes to get inspired and ready for the holidays. This get together was arranged by Heather of Hezzi-D's Books and Cooks. Check out all of the holiday side dishes below. I'll be back on Sunday with another collection of holiday side dishes, including an amazing mashed potato casserole. Heat the oil in a 4 quart saucepan over medium high heat until shimmering. Add the neck and giblets (and optional wings) and sauté for five minutes. Add the onion and cook for about 3 minutes, until softened. Reduce the heat to low and simmer for 20 minutes. Add the broth and water and heat over high heat, scraping the bottom of the pan to dislodge all of the browned bits. Bring the pan to a boil and then reduce to low. Add the thyme and bay leaf and simmer for 30 minutes. Strain the broth through a mesh strainer, and discard the solids. At this point, you can refrigerate the broth. When you are ready to make the gravy, melt the butter in a four quart sauce pan over medium heat. Add the flour and cook, whisking constantly, until the roux is light brown, about the color of honey. In the meantime, bring the broth to a simmer. When the roux is ready, add the hot broth, about a half cup at a time, whisking constantly. Once you've added all of the broth, simmer, whisking occasionally, until it thickens. This should take about five minutes. At this point, you can set it aside until the turkey is done. If it is the day before, refrigerate it until ready to use. Bring the gravy to a simmer, and add the optional defatted pan drippings and simmer for about 2 minutes. Season with salt and pepper (taste first before adding salt). I need a gluten free recipe for gravy. Any suggestions? Thanks. You can try subbing corn starch instead. 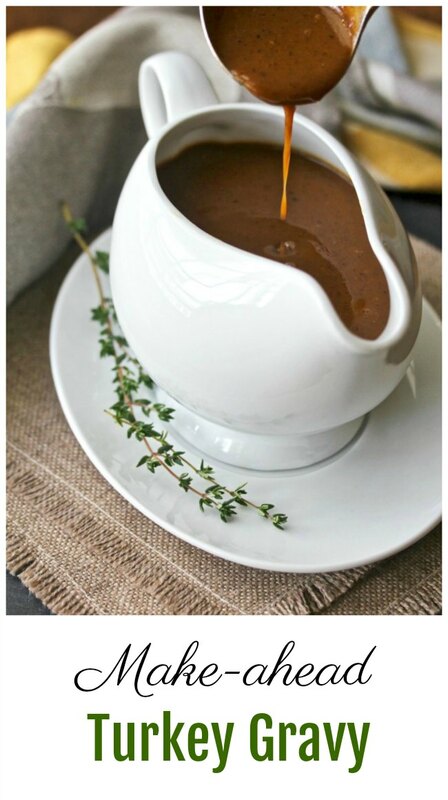 I always feel like I am rushing making gravy so this is definitely something I think I need to try! Great idea. I always stress over the gravy! Me too. Not this year! For us here (since we don't have Thanksgiving) this is an exceptional sauce that can be used again and again:) It's super yummy and we can't wait to try it! Wishing you and yours a wonderful Thanksgiving dear Karen! Such a smart idea Karen....why didn't I think of this years ago? Just think of the stress I could have avoided. Enter your email address here to get every new recipe. ©All photographs & posts by Karen Kerr 2012-2019, unless otherwise stated. Ask for permission. Powered by Blogger.